As with the vast majority of this SNES port, the latter stages played out much the way I remember so I’ll be keeping this post reasonably short. I got hold of both the lenses I’ll need for the end of the game then headed for Sutek’s castle to get hold of the balloon plans. The castle was still guarded by murderous rabbits but there was a slight change as I’m sure the original game needed a telekinesis spell for lowering a drawbridge. 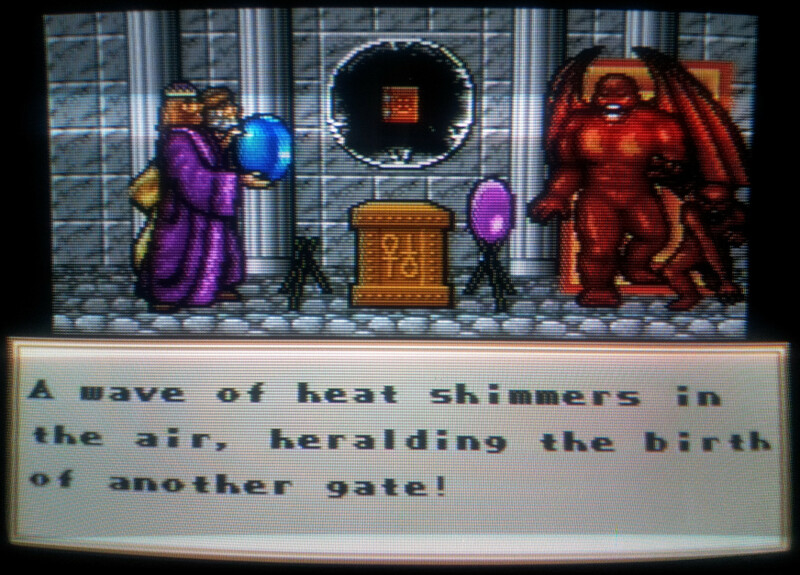 This port has no such spell so it’s just a case of blasting the front door open with a powder keg. Once I’ve fetched the plans, I travel around Britannia collecting the various parts to make my balloon. In part 4 I was concerned about not picking up the fan but it turns out that it’s not needed on the SNES and I can move wherever I like freely. Building this is arguably something I should have done much, much sooner as it’s a great way of getting about. That only leaves the vortex cube to be fetched which is in Stonegate. I balloon my way there and locate it in the cellars of the former home of the Shadowlords. Around this time, I realise that I forgot to pick up my balloon when I entered and return to find it has vanished. 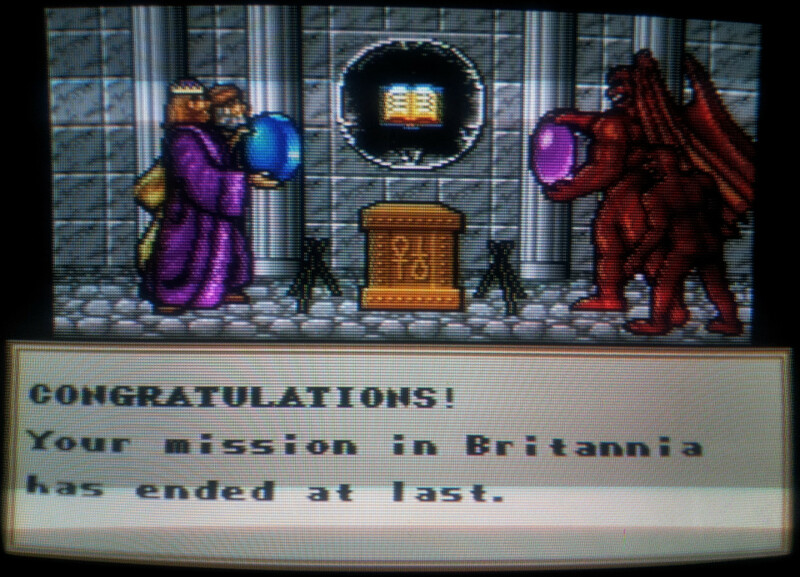 This leads to another journey around Britannia collecting everything I need all over again. Being more careful with my new airship, I head for the Shrine of Singularity to get the final quest to go into each of the shrines of the gargoyles principle virtues. Two of these are relatively simple with only the Shrine of Diligence being a right pain until I eventually manage to figure out where the secret door is. 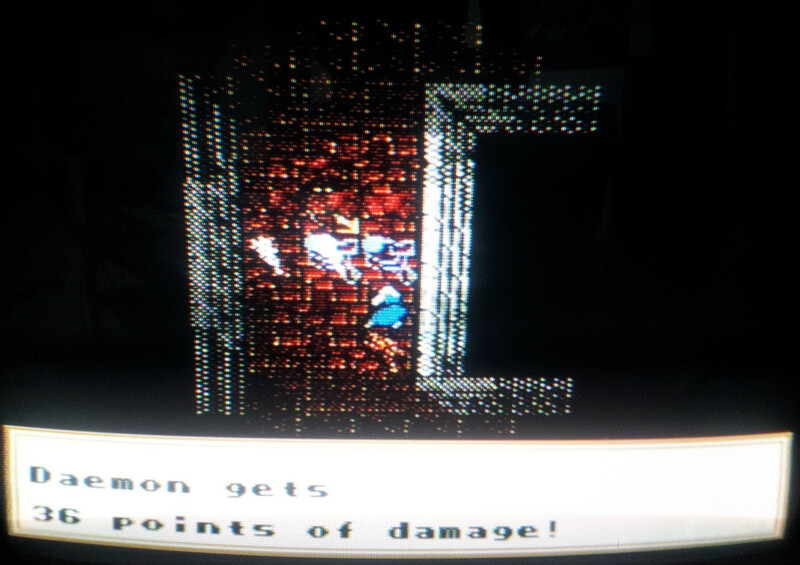 Even then my party gets flattened by a horde of daemons on the second floor. 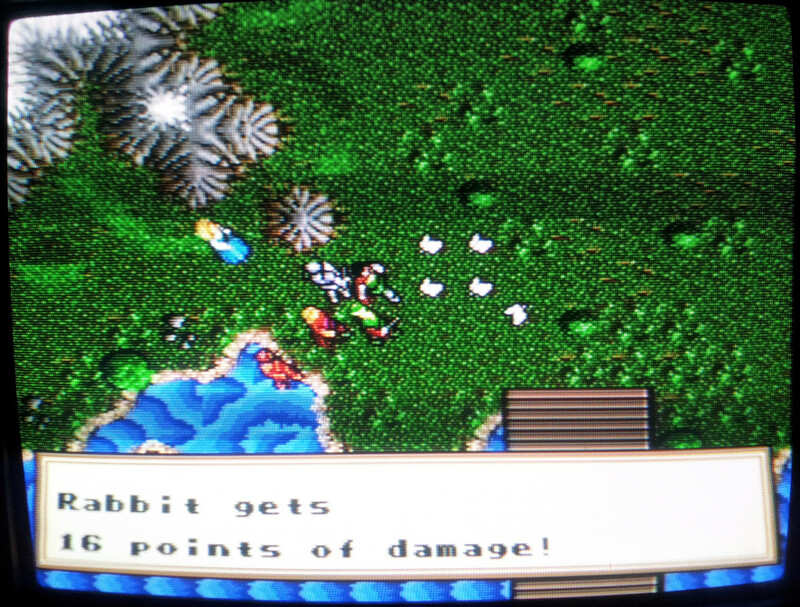 I’ve found the combat against the stronger creatures in this version a little heavier going than I recall on the PC. I’ve still not invested in any equipment for my party so I could certainly have made life easier for myself. There is no gargoyle mantra to collect in each of the shrines, I merely have to talk to them and then return to the Shrine Of Singularity to receive the final goal to go to the codex. 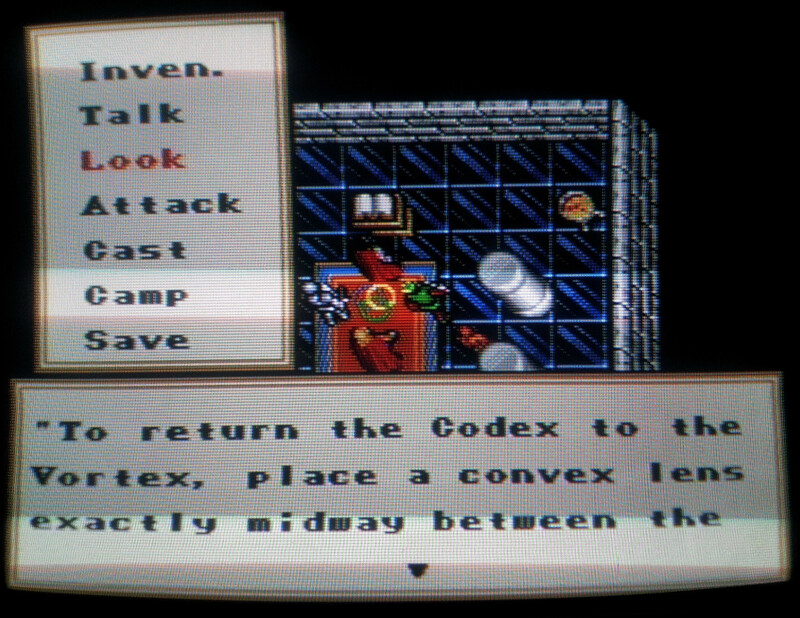 With everything in place, there is a show of swirling lights before the codex vanishes. The final cutscene is there in full (with slightly altered graphics). The music is just one piece all the way through and it’s not exactly obvious to my ears that it’s the gargoyle music playing in chorus with Rule Britannia. This is a loss as it was a great little twist for the ending. I’m not asked to report my feat to Lord British but I imagine Origin would have run out of Ultima 6 certificates by the time this came out. 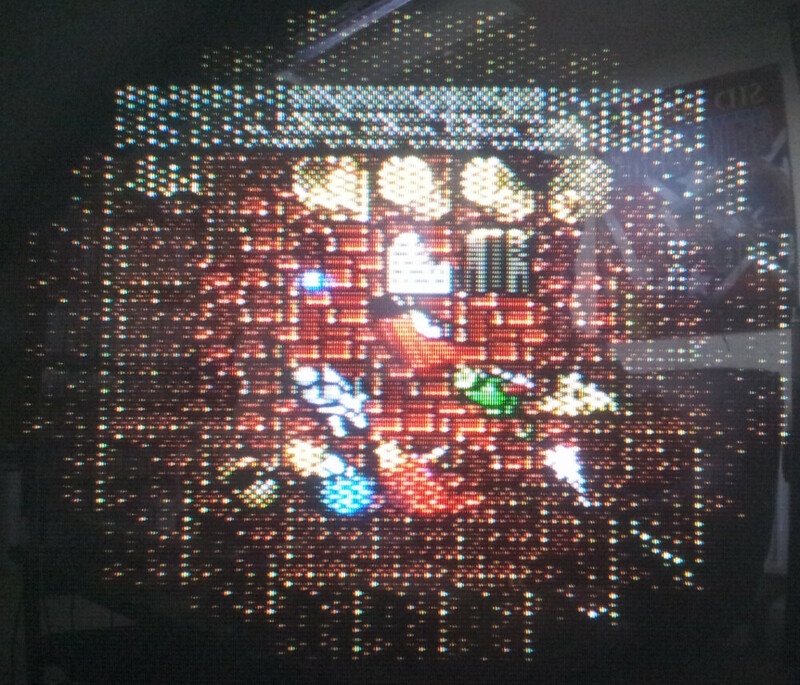 It must be about a month since I started Ultima 6 and all the gaps I’ve taken in-between are no way to play any RPG. I have still really enjoyed this port when I’ve had the time to get into it. 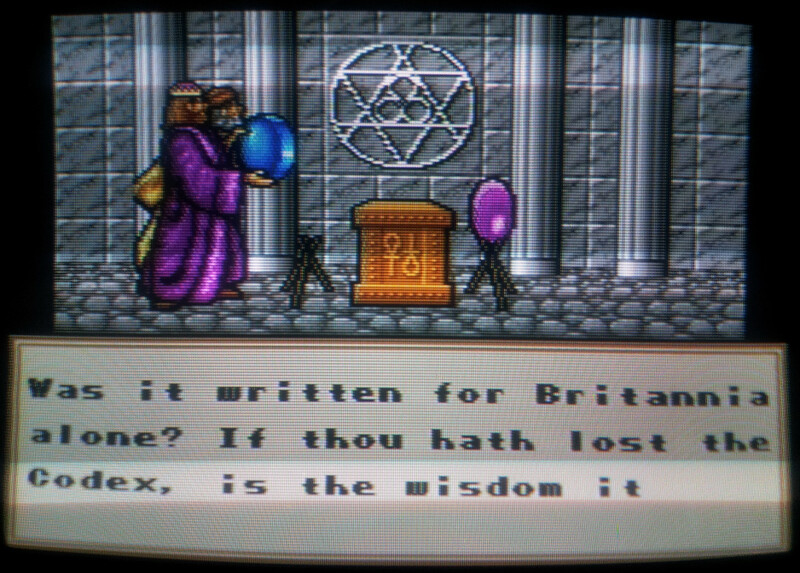 It’s the sixth Nintendo Ultima I’ve played if I include the Runes of Virtue games and easily the best of the lot on it’s own merits. I’d prefer it if nothing had needed to be cut but I can’t say I missed anything that was left out all that much. The fullscreen graphics during daylight hours make up for it even if it does seem to be permanently winter in Ultima 6 if the length of the nights is anything to go. Before I started I didn’t think the SNES would be up to a game the size of Ultima 6 and was expecting far more compromises. The irony is that for an Ultima fan who has already played all of the games and is looking for something different, this is arguably the least interesting of the Nintendo Ultimas because they changed as little as they did. It would be a great choice for playing via an emulator on your portable of choice if you want some Ultima on the go. I’ll be taking a quick look at Savage Empire on the SNES next. It will have to be quick as I don’t speak Japanese and won’t be able to do a whole lot more than run around the map. All the missing posts are back on the site now (minus some images) + I spent ages tonight fixing email delivery which I discovered was broken. Hopefully I can recover those images but everything else is restored once again. The last job remaining is to do another backup which thanks to a quirk in the software will mean downloading the entire site again. 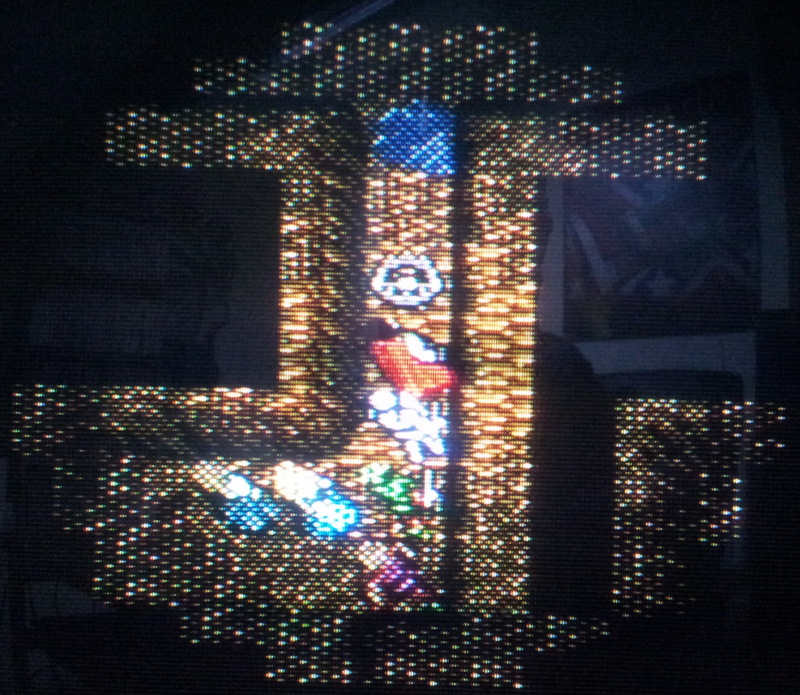 That’s scheduled to run overnight though which means I can at long last get back to the Ultima 6 playthrough. I’ve not touched the game in nearly a week while sorting this out but will do my best to remember where I’d got to. To recap, the problem I’d run into some weeks back was dragons and lots of them. I couldn’t even make it to the entrance of Destard, let alone plumb it’s depths for the dragon eggs I needed to progress. I had to level up but rather than doing this through needless grinding I headed for the giant ant mount in the north-east to search for one of the other missing map pieces. This worked better than hoped as the ants offer little threat but plenty of experience. I’d got to level 7 by the time I left meaning I could cast the invisibility spell which I hoped would get me through Destard. The invisibility spell did indeed stop all enemies from attacking my party while leaving me free to attack them back and as such did provide the means to tackle Destard. 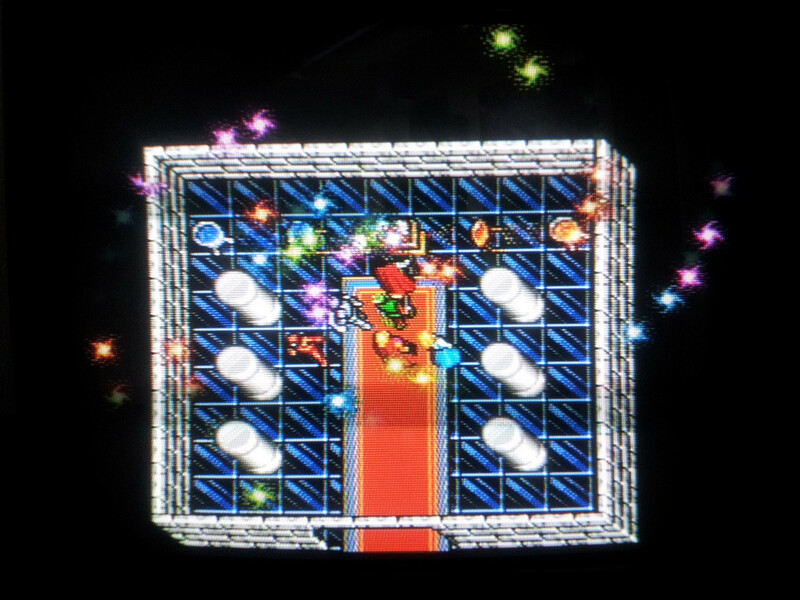 It wasn’t perfect though as it tended to wear off on my party members quicker than myself. Also all the enemies still followed me around even though they didn’t attack so I was soon surrounded by swarms of drakes and dragons. With no way to exit combat and run away the combination soon led to all of my party being killed off and the Avatar having to tackle Destard single-handed. Thankfully, the Avatar is by far my most potent attacking force so this wasn’t all that much of a handicap. There was some reloading required when invisibility ran out at inopportune times but I managed to make it to the bottom level and purloin the eggs. A quick suicide later and my party were all resurrected and ready to search for more map pieces. Destard has proved to be by far the hardest location in the game and gathering the rest of the map pieces was just a case of traversing Britannia completing the various quests. 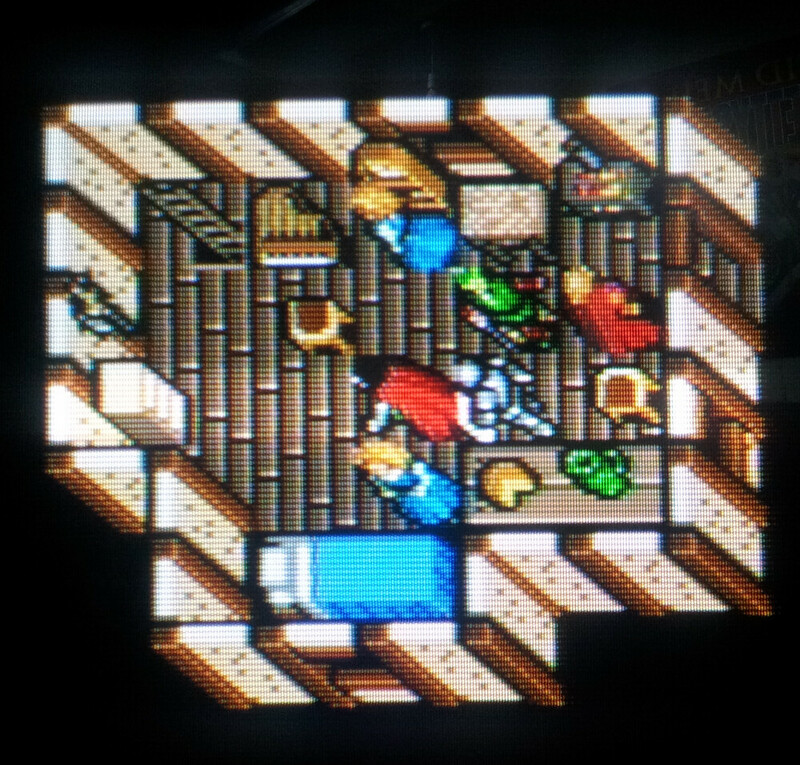 About the only difference I noticed was that on the PC I would have to move the harpsichord to reveal the trap door in the room above but with no move command on the SNES it had already been done for me. Once I had the 8 pieces, I headed back to Buccaneer’s Den. I was outright told where to look for the island with the buried treasure which isn’t the way I recall it going on the PC as it completely removed the necessity to build the map at all. At any rate, I followed the directions and grabbed the other half of the tablet. Something I didn’t do in hindsight is pick up a fan from the same room to control the balloon later in the game. I don’t recall seeing this so maybe it’s not in the port but I expect I’ll be making another trip back down through this particular dungeon to retrieve it later. I didn’t fancy dealing with more dragons so I skipped Hythloth and moon orbed my way to the gargoyle realm after speaking to Mariah. I’d got as far as recruiting Beh Lem into the party after eventually figuring out how to dismiss a party member to make room for him (this isn’t where you would expect in the conversation tree), and had submitted to wearing the amulet of submission. There is still plenty to do but I’m closing in on the end of the game now. One more concerted effort should be enough to finish it off and I’d hope there won’t be such a big gap between posts this time. The first job in Ultima 6 as I remember it is to go around all of the shrines ridding them of gargoyles which was the task I set myself for this next part. This in turn this requires the mantra and the rune to be gathered from each of the respective towns. I gathered the rune of compassion in part 1 so I head straight for the shrine with that only to find that the combat with all those gargoyles is a little much for my starting party. I expect we all know the U6 story well enough to realise that I shouldn’t really be killing off the gargoyles but there doesn’t appear to be any button I can press to come out of combat mode so it’s not really optional. This isn’t the version to play for the more pacifistic Avatars out there. Coupled with that, there is no means to pick a single party member to control as with the PC Ultima 6 engine games. I always liked that feature of the engine too – it led to some nice little puzzles in the spin-off games but here it’s strictly one for all. The combat gets considerably easier once I start to get some better equipment and level up a little but since I need the shrines to level up in the first place I resort to some judicious saving/loading to get through this first battle. I don’t do anything significantly different on the subsequent attacks but eventually I’m victorious. 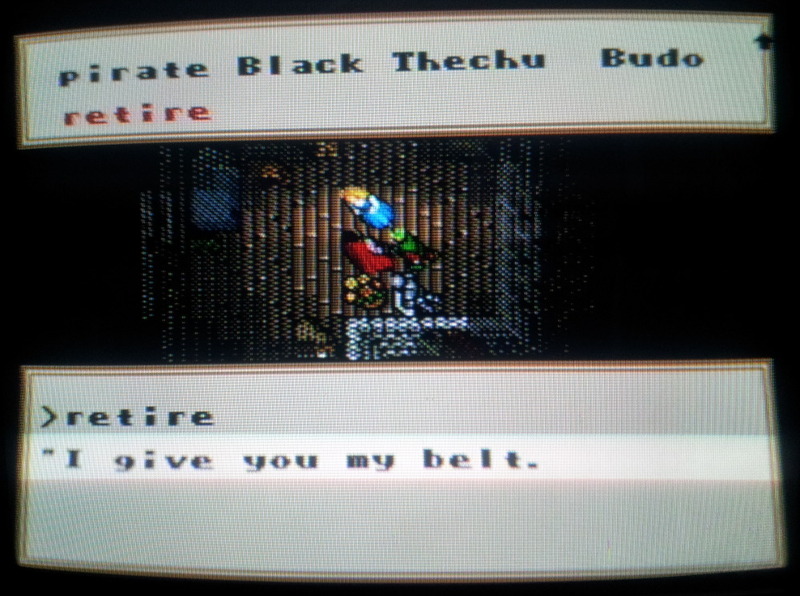 On the SNES I don’t have to learn/use the mantras at the shrines. I use the rune to remove the forcefield and can then talk to them to level up/meditate. An Ultima game of this era without mantras seems like heresy but I suppose my Avatar should have them down by rote at this point. 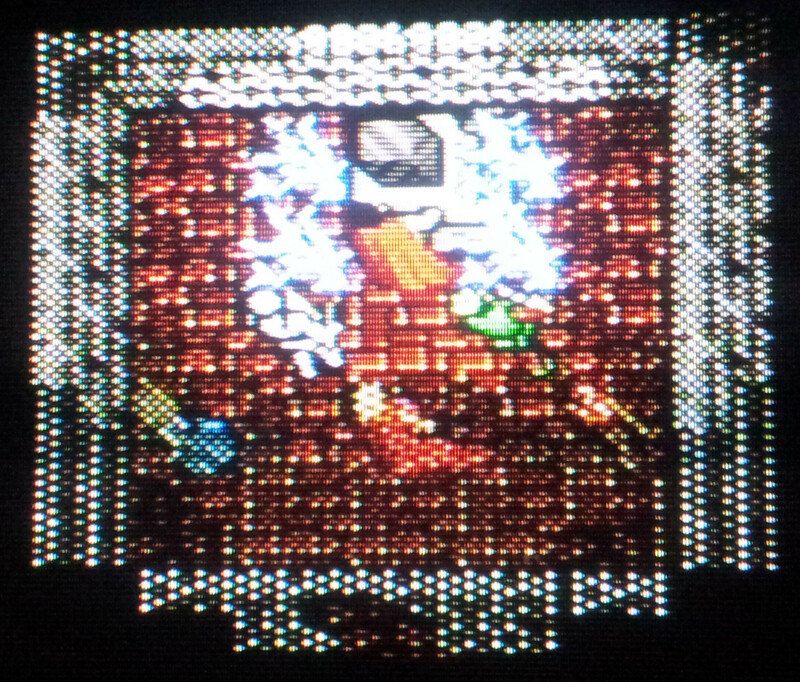 Another oddity on the SNES is that combat leaves no bodies behind but does occasionally leave chests to search for treasure in something of a nod to early Ultimas. Along with the missing bodies, this port apparently has references to death removed even down to the extent of the healers casting “Great Awaken” on expired party members. Even dead party members don’t have bodies but become ghosts that follow the rest of the party around still carrying all their equipment. Reviving them is quite expensive but with maximum karma (which I soon have after clearing a shrine or two) there is no penalty for death so it’s far cheaper to kill off my Avatar and then the whole party is revived for free. A definite money saver. Using the orb of the moons to speed around, I go from town to town repeating the process of freeing each shrine. 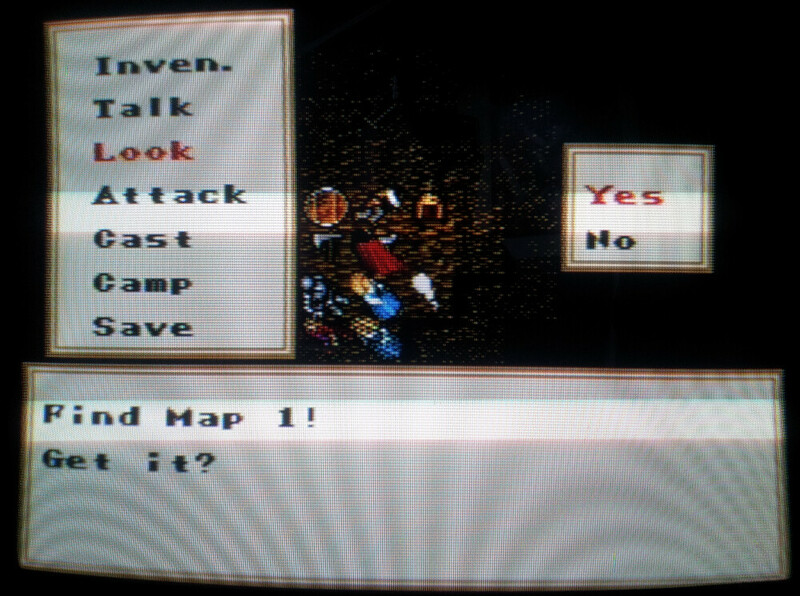 Exploring the towns was my favourite aspect of playing Ultima 6 with the incredibly detailed conversations and characters. In this port some characters are no more chatty than their Ultima 4 equivalents after their conversation was cut to fit but there is still plenty of life to the towns and it’s impossible not to enjoy even this cut down version. Fetching all the runes played out much as I remember it but it’s been a few years. 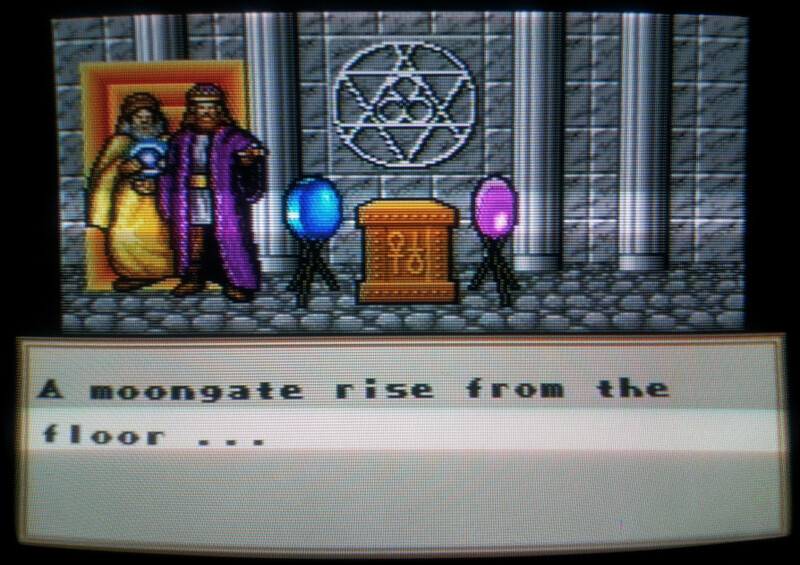 The original had a strange quest in New Magincia where I had to find out which person in town was the most humble. This has been replaced instead by a wild goose chase where every person in town has lent the rune to someone else in turn except they fail to mention it unless I follow the chain through one person at a time eventually back to the town mayor where it started. The quest for the rune of valour still involves getting Sherry the mouse to go through a hole in the pub wall in Jhelom. With the lack of individual party member control this presents a problem which is handled by making Sherry an inventory item instead. If I use her from the inventory I get control until I run her back to the Avatar and then everything she is holding gets dumped in the Avatar’s inventory. There are other concessions to the less flexible game engine. There is no playing musical instruments here so Gwenno just has to teach me stones which is then picked up automatically when trying to join the guild in Minoc. This was the last of the 8 runes and playing this far took most of a morning. With all 8 shrines freed, my party was at a stage where they are now well able to cope with most combats. One valid tactic appears to be to just keep carrying out kamikaze raids on the gargoyles until successful, then getting my avatar killed off at the next shrine if needed to revive the rest of the party. With the gargoyles regenerating after each failed attempt, it’s a great way of building up experience although I might criticize this as rewarding failure. The second (and from what I recall much longer) stage in beating Ultima 6 is tracking down the second half of a tablet which is needed at the Lycaeum to translate the Gargoyle Book of Prophecy. Step 1 is getting to Buccaneers’ Den which inconveniently isn’t on the route of the orb of the moons. I decide to go via the sewers under Castle British which first means buying a skiff to get to an island on level 3. This is all going well enough until with my party safely skiffled I run into a horde of rats. I wasn’t expecting the combat system to kick in at all in this situation but I’m forced to fight them from within the skiff except none of the rest of the party get a turn so my Avatar is single-handed. He eventually beats them down but gets poisoned in the process and doesn’t survive the rest of the trip. I’ll make another attempt at this in part 3 staying further from the shore. The sewer dungeon layout and every town in Britannia for that matter have been exactly as on the PC to the best of my knowledge. 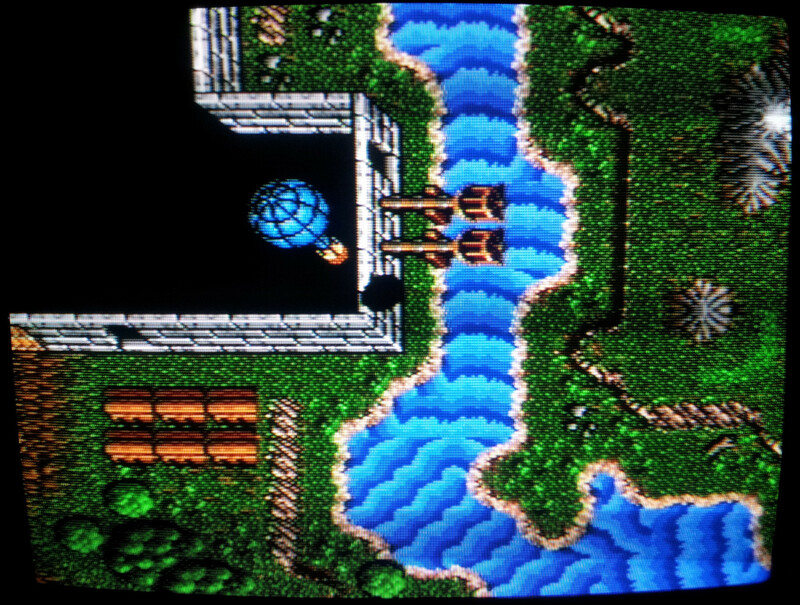 Now I’ve had time to explore, U6 SNES is turning out to be a whole lot better than I’d hoped it would be. There have been compromises to the platform but out of the 4 Nintendo ports I’ve played so far this is easily the one that is most like an original Ultima. It’s got me not wanting to stop playing at any rate and I’m looking forward to gathering the treasure map next. The CIC birthday bash has been and gone for another year. I’ve made a mental note not to walk over 30 miles during the day next time I’m planning on staying up most of the night but I managed to hang around longer than expected even if I was (and still am) less than lively. Ploughing through most of those updates will have to wait until some mental capacity has returned but the ones that have caught my eye so far are an incredibly harsh post-mortem for Privateer 2 and the EA sales data list which has a few surprises. I’ve two versions of this with the Japanese edition on the left and the US on the right. Unusually the Japanese one is far easier to get hold of as I recall with the US release being a little uncommon. The two lots of packaging bear no relation to each other with the Japanese edition using the original cover and the remake having new original artwork. There isn’t much to choose between them for my money but the manual for the US release wins on the presentation stakes even if I can’t judge the content. The NES manuals included a slew of hints and maps which aren’t present here leaving it up to the player to figure most things out for themselves. It does give a grid for using the orb of the moons though encouraging the player to use this right from the start rather than walking between towns. SNES Ultima 6 was ported by Pony Canyon and published in 1992 in Japan which puts it a year earlier than Ultima 5 came out on the NES. It didn’t make it over to the US until the following year though. It’s safe to say that Ultima 5 on the NES wasn’t exactly a triumph and bore only a passing resemblance to the Apple II original. With the move to the SNES, my hopes are far higher for this port. I’m also quite keen on playing U6 again whatever the format. 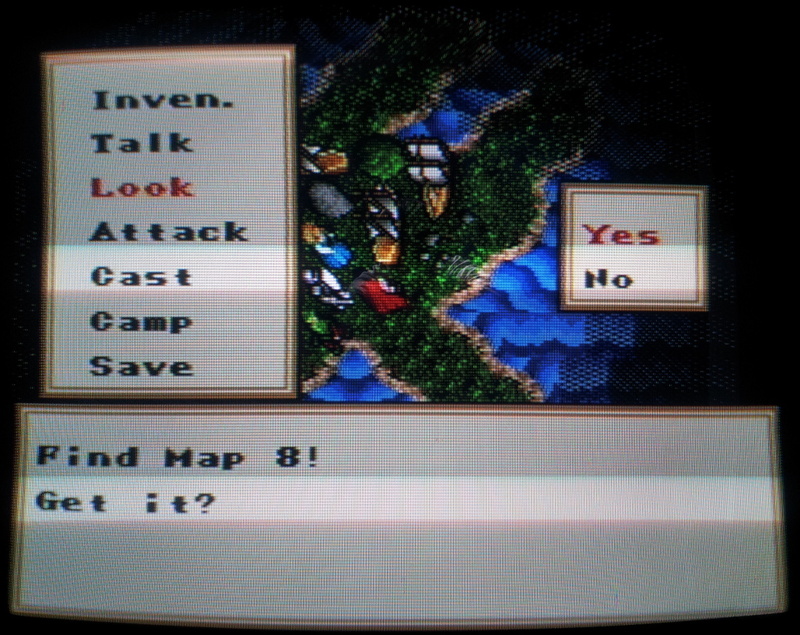 Around this point I start to get less and less familiar with each newer game in the main series until Ultima 9. I can live without returning to Ultima 8 but the three games prior to that are all long overdue another look after a 5 year gap. We get off to a good start with the original introduction more or less intact. 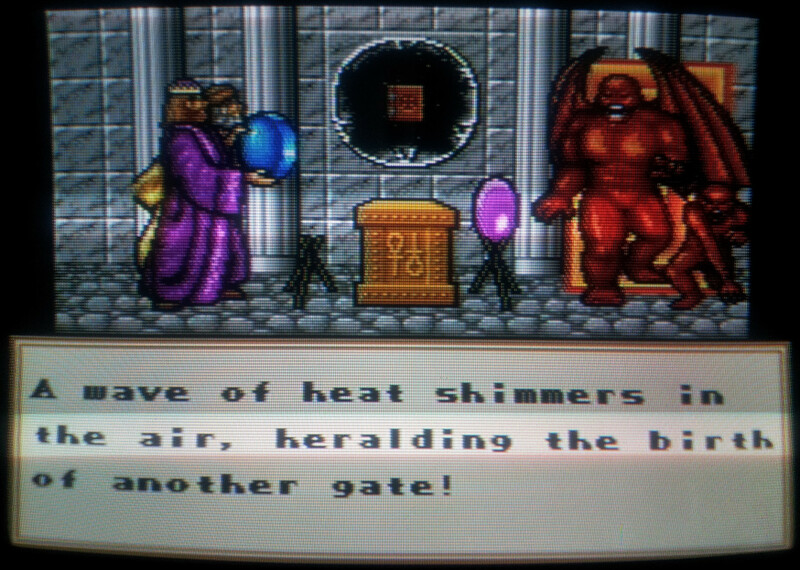 The text has been slightly altered and the Avatar shuts his eyes at the point the Gargoyle priest is crossbowed (thus avoiding excessive violence in a Nintendo product) but it’s all to the same effect. The main thing to note here is that I didn’t go through any character generation whatsoever missing out one of the more famous aspects of Ultima games. 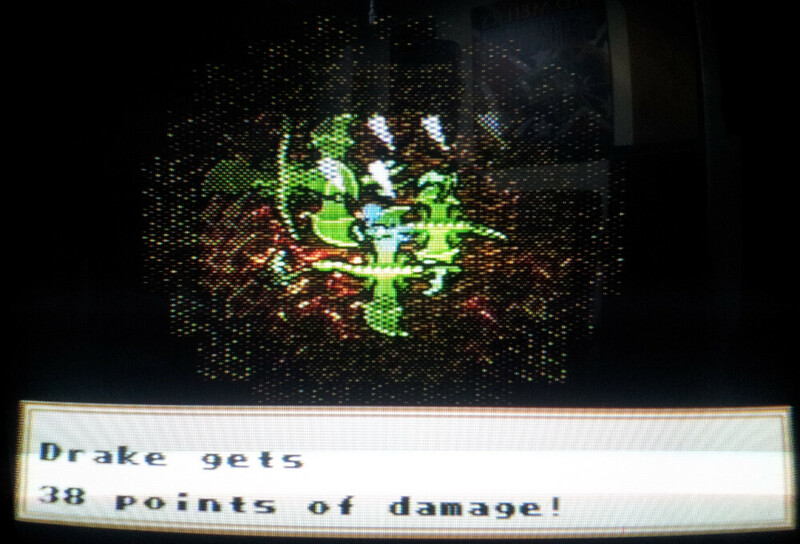 My generic Avatar is dumped straight into a battle with the gargoyles to start the game. This gives me a chance to have a look at the new interface which is a radical departure from the PC original. The first thing to note is the full screen graphics. One of the criticisms I’ve heard over and over of the U6 engine is that the viewing window is too small, especially when combined with the lighting effects at night which shrink it down even further. Lighting effects are still here but with a full screen view of the world, it’s visually a lot more like playing Ultima 7 which can’t be a bad thing. This is limited on the SNES to a degree as the world isn’t always on one map and loads when entering certain buildings and rooms. The combat itself is intuitive using a self-explanatory menu system. There is even an auto option which appears perfectly adequate for bashing at the nearest opponent. I would argue that the control scheme used in the rest of the game doesn’t make good use of the multitude of buttons on a SNES gamepad. Almost everything can be accomplished with just the A and B buttons through menus which works but it would be far quicker to use the rest of the buttons to speed certain tasks up. 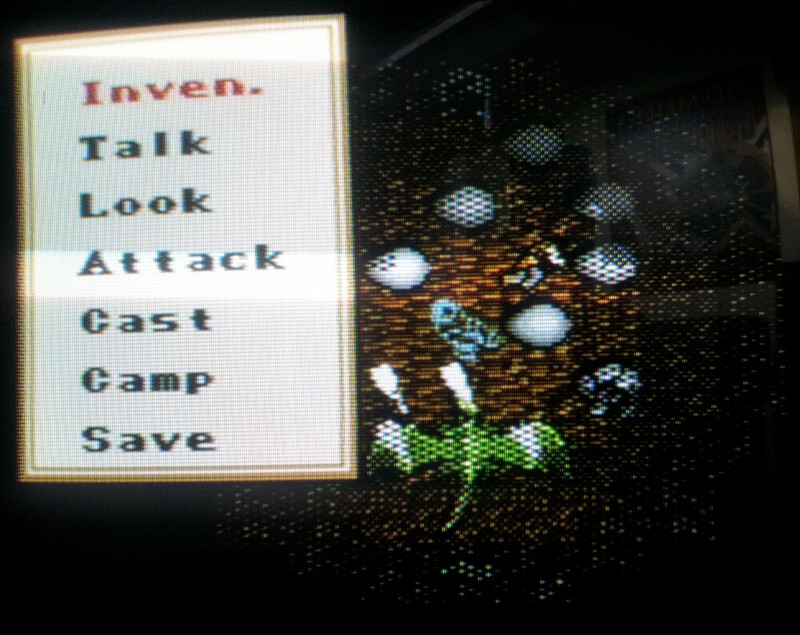 Conversations use keyword menus and are a monumental improvement over Ultima 5 NES as much in quantity as structure. There aren’t any character portraits admittedly which is a loss but I’d rather have the extra text. I’ve only explored Britain so far and I’m not familiar enough with U6′s original conversations to compare them without getting both versions running side by side. I got the impression that the conversations have been cut down and possibly some characters cut altogether but there is enough left that it’s not entirely obvious. There were definitely people who I couldn’t locate such as Kytyn at the museum but the NPC’s have schedules so I may well just have been looking at the wrong time. Navigating through the inventory is a little clunky in this version, not to mention slow with a decided delay in bringing up the screen in the first place. It’s close to the PC version in appearance and functionality but in terms of ease of use on a console I’d say it’s arguably the weakest of any of the Nintendo ports so far making it my least favourite aspect of this version on early impressions. The final thing I’m going to mention with the controls right now is picking up items which appears to be done by looking at something in the world and then pressing A again to use it. This is all very well except if I look at a bag I then search it and have to pick up the items one by one leaving the bag behind. With the difficulties of navigating my inventory I might be better off without bags anyway but I expect I’ll be running out of room quickly. The controls then could either use some tweaking or I still need to learn how to use them properly. The graphics however are excellent and I do like having the full screen to play in. The music is straight off of the PC version and not sounding too shabby at all through the SNES with the sound effects like ticking clocks being an improvement. All I’ve done so far is explore Britain which is much the same bustling city that I recall. After the Japanification of Ultima 3 and especially Ultima 4, this port appears to be surprisingly true to the PC and so far I really like the look of it. By comparison to Ultima 5 NES, it’s safe to say I’m going to have some fun playing through this one.